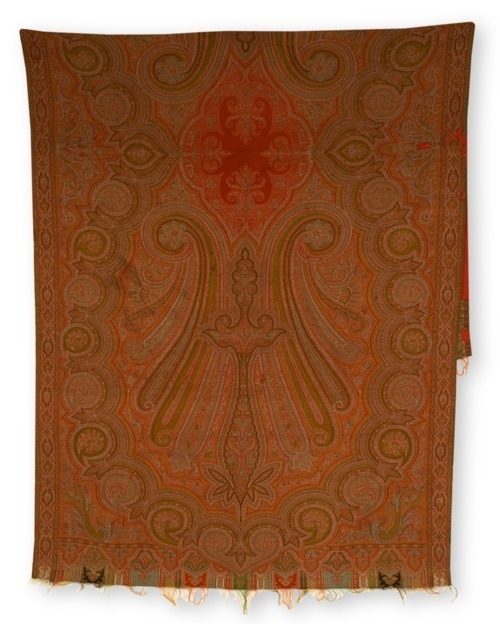 Large wool shawl woven in paisley design with red ground. This shawl was wrapped around Elizabeth Ruppert as an infant when her father, Edmund, fled from Virginia to Leavenworth, Kansas in 1854. Edmund's wife (Elizabeth's mother) had died and his in-laws were threatening to abduct his daughter. Elizabeth kept the shawl until 1893, when she wrapped it around her one-year-old grandson for his family's migration to Oklahoma Territory during the Cherokee Land Rush.